Recently, my wife and I travelled by coach through Central Australia. 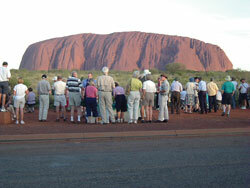 Coach tours are great because everything is organized, we see a lot, and enjoy good company. On our coach we got to know people from six countries. Tourism, it seems, is the world’s largest growth industry. That is not surprising because travel expands our understanding and enjoyment of the world. The modern tourism fad can lead to bizarre situations. I couldn’t help smiling when we gathered with hundreds of other tourists in the remote outback, sipping drinks and nibbling savouries, to watch the sun set on an isolated rock (Ayers Rock pictured left). Our tour director was certainly interesting, informative and well read, and it was not as if he was deliberately pushing an agenda. He was simply passing on information he had learned from publications and interpretive signs. The idea of millions of years is just part of our culture. But it has not always been that way. The facsimile of the first edition of Encyclopædia Britannica reveals that not so long ago most people accepted the Bible as true history, and thus believed the world was only some 6,000 years old. In spite of the evolutionary commentary, what we saw on the trip led naturally to conversations about creation and the Bible. In spite of the evolutionary commentary, what we saw on the trip led naturally to conversations about creation and the Bible. 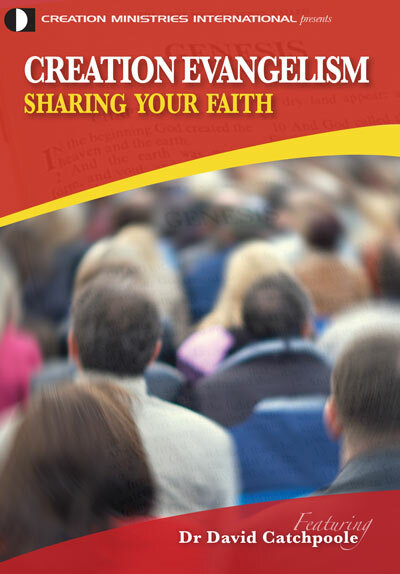 We were able to explain the biblical view to many, and even have the opportunity to share copies of Creation magazine. He begins by describing how the surrounding landscapes were carved—that water once covered the land and then receded into the ocean. Initially, he explains the geological processes without dates, and without mentioning Noah’s Flood. Gradually, an incredible curiosity develops in his passengers. After a couple of days, when they are well acquainted and know his Christian and scientific background, he is able to give a plausible biblical chronology that fits the geological periods scientifically. The tour gives him many evangelistic opportunities. Many landscapes provide strong visual evidence for Noah’s Flood, and the article starting on p. 34 deals with a familiar landform and how it was carved. It explains the significance of the distinguishing features you often see on landscapes around the globe. Granite landscapes are another distinctive landform. The feature on p. 46 describes some tiny ball-shaped ‘stains’, found within the granite grains themselves—stains that point to geological catastrophe and the global Flood. 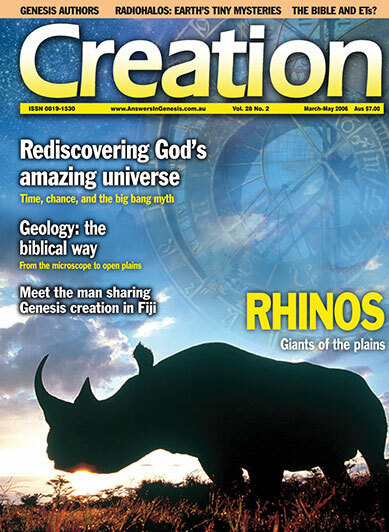 You could look at this issue of Creation 28(2) as a bit of a travelogue, taking you to many countries. In the interview with Maurice Nicholson you will visit Fiji and discover the impact creation has had on that Pacific-island community. Then you can skip across to Asia and Africa to learn about the amazing design of the rhino. Forest ecologist Joe Havel will carry you to New Guinea, New Zealand and South America, while author Gary Bates will even take you out of this world, to Mars and beyond. 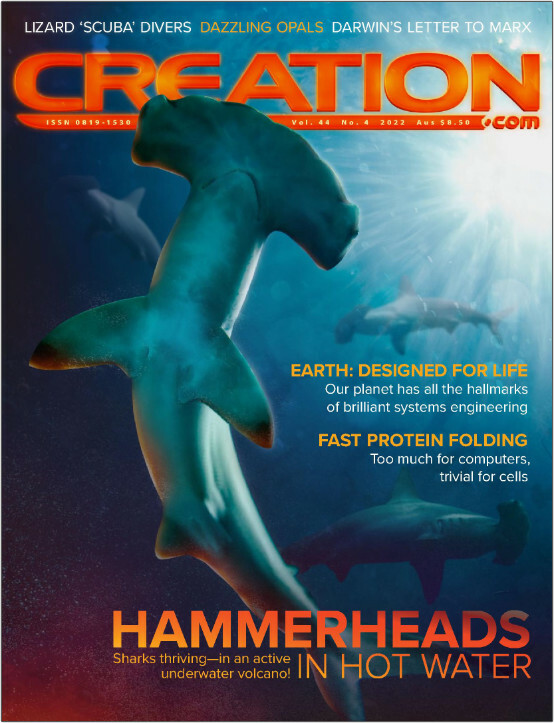 So we hope this issue of Creation magazine will expand your understanding of the world and help you find your place in it. We hope it will encourage you and give you information you can share with your friends.